Do you want to sell proof sets? We buy all proof sets. Midwest Coin and Collectibles will provide you with a free, no obligation purchase offer for your coin collection. Because we buy all proof and mint sets, will sort out your sets and provide free purchase offers Midwest Coin is the bet choice to sell proof sets to. 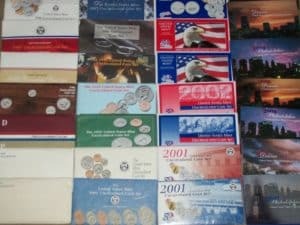 Therefore, selling your proof sets to Midwest Coin is a the best choice. US Mint Proof sets are sets of coins that have been specially struck with polished surfaces and, in recent decades, frosted images. Almost all proof coins have shiny surfaces. Cameo proof coins are proof coins with frosty images. Cameo proofs, while highly common since the late 1970s, are rather uncommon among proof coins from earlier years. Therefore, newer Cameo Proof coins are not rare. Overall, the majority of proof coins struck since 1936 have brilliant, mirror-like surfaces and minute details struck in great clarity. So, pre-1936 proof coins with brilliant, mirror like finishes have extra high premiums. The US Mint manufactures common, regular coins for Mint Sets. Mint sets contain coins that are uncirculated and look like (and are) straight from the Mint. However, they are not really any more unusual, shinier or well-struck than usual, newly minted coins. Therefore some mint set are less valuable than proof sets.